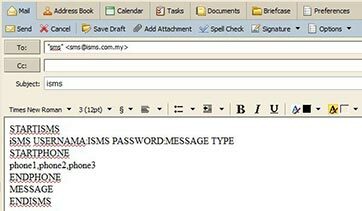 iSMS Malaysia currently enables you to easily send SMS to multiple recipients from your email account or e-mail client to any mobile phone network worldwide. You can send a text message to any mobile phone from within any email client, including Microsoft Outlook and Outlook Express, Eudora, AOL and Pegasus by following a simple format. Regardless where you are, you can be planning to send sms to Singapore and receive text messages provided you have access to email. For more information adding SMS functionality visit our Developer API page HERE. Learn everything about our latest feature and all its configurations. Gain all the benefits you can by implementing this Email to SMS feature in your organisation. 2. You may replace the information based on the sample below. Active service monitoring: Service monitoring is there that ensures 99.9% delivery of messages with nearly no downtime. 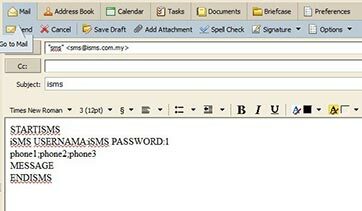 iSMS Malaysia's email to sms feature allows you to send SMS from your email account. With this you can send Bulk SMS from any e-mail client or application across the world using our SMS gateway solutions. Thus, you do not always have to logon to your iSMS account to send bulk SMS. Send latest information or appointment reminders with your esteemed customers and partners. Send bulk SMS even if you have no direct internet connectivity but are still connected to the mail server using Outlook or Thunderbird. 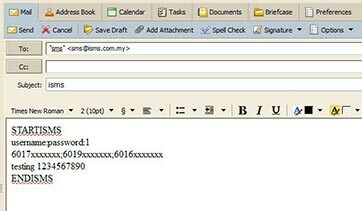 When using iSMS Email to SMS Services, always send email in plain text format, otherwise the HTML text will be included in the message text. Please ensure that you prefix all the mobile numbers with the country code. E.g. India uses 91 before the mobile number and for Argentina uses 54.
iSMS offers Email to SMS service for sending emails as SMS the easiest way. The service is designed to deliver SMS, efficiently from anywhere in the world, anytime. This offering is developed for the messaging needs of the users who requires instant implementation. 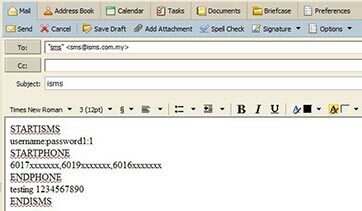 For sending email to SMS, all the emails will be directed to iSMS SMS server & they automatically get converted to SMS messages. Then finally, transmitted in real-time using our high bandwidth connectivity with multiple mobile operators across the world. Our Email to SMS Service is a great solution that fits seamlessly in a government organisation, corporate enterprise or any businesses.